Important! Don't skip this bit, no matter how tempting! Take your chosen hook and chosen yarn, chain 12 stitches. Crochet 1 dc [tr] in the fourth chain from the hook (counts as first dc [tr]), then 1 dc [tr] in the next nine chain stitches. You now have 10 dc [tr]. Take a ruler or measuring tape and measure the length of these 10 stitches. If I wanted to make a full-length blanket, say 2 metres long, my starting chain would be 290 chain + 2 chain to form my first "dc [tr]". Chain 290 + 2 chain to form my first "dc [tr]"
I want to make a baby afghan and I'd like it to be approximately 80cm long, including a border. Cut yarn for colour change, weave in your tail, turn your work and start with a new colour. If you finish the row with dc [tr], you'll start the next with sc [dc]. If you finish with sc [dc], you'll start with dc [tr]. As you can see, I've finished the row with dc [tr] so when I turn my work, I'll start with sc [dc]. 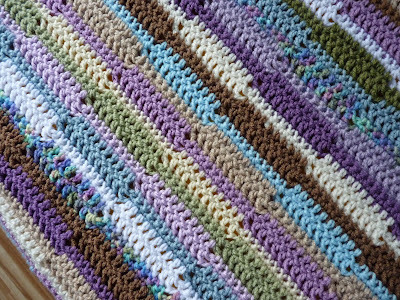 You do one row in Colour 1 to start your blanket. 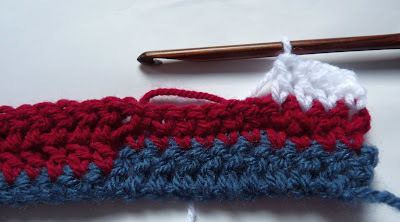 After that, you will do TWO rows of each colour. So join a new colour here! Crochet 2 chain to start the row (this functions as a 'fake' first sc [dc],) then 1 sc [dc] in the next 9 dc [tr] of the previous row. * Chain 1. Crochet 1 dc [tr] in each 10 sc [dc] of the previous row. Chain 1. Crochet 1 sc [dc] in each 10 dc [tr] of the previous row. Repeat from * to end of row. 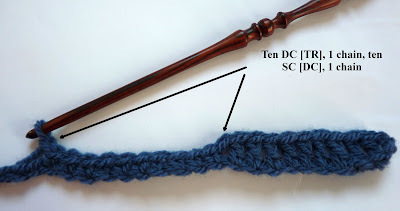 You do 10 of the same stitches in the stitches of the previous row: in other words, 1 dc [tr] in each of the ten dc [tr] in the previous row - or 1 sc [dc] in each of the ten sc [dc] in the previous row. But don't forget to do your chain stitch between each group of ten stitches - this allows for the difference in height between the stitches. If you don't do it, your work will curl. 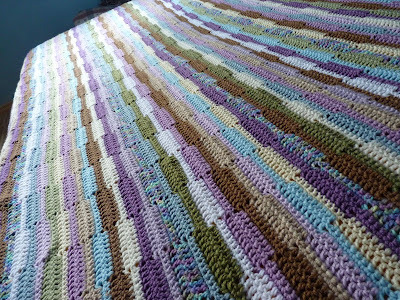 And so you continue: after a single row in the starting colour, two rows in each new colour. Here you can see I'm starting my fourth row in white, doing 1 dc [tr] in each of the 10 sc [dc] of the previous row. And on it goes, up and down the blanket, till it has reached the desired width. You finish by doing just one row in your finishing colour, this gives it an even edge. You can then do a single row of dc [tr] or sc [dc] around the afghan to make it neat. You may not reproduce this pattern in print or claim it as your work. You may not sell the pattern. Do not copy and paste pattern to another website, please use a link. Update: see this post for some pictures of other people's Ribbon Afghans! Love all of the colors. What a beautiful pattern! Thanks for sharing! I REALLY like this pattern a LOT. I love how the thick and thin stitching gives it the look of a pieced quilt, and I love that, even with my limited ability to follow crochet patterns (I'm really mostly a knitter; my crochet is pretty much regulated to squares and crocheting up interesting creatures on the fly), I could actually make this one. Wow I love this, I also love how you used these colors for a baby afghan. Thank you so much for sharing! I love the pattern! Think the colours are so cool!!! And yes, I too am a printers daughter and have only just now stumbled upon that website that makes the pdf's. How groovy is that?!!! Well done, it looks great. Very nice! :) Thanks for sharing. Beautiful! And an explanation of gauge that FINALLY makes some sense to me. Gorgeous and simple. My favorite kind of pattern. Sherrie, I looked at some of the projects on Ravelry, where others have used the pattern to make their own blankets. 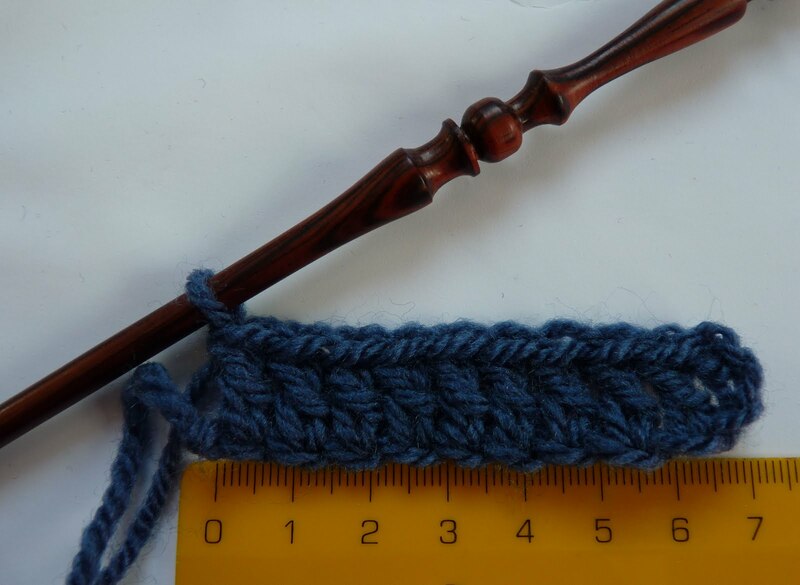 For a single-bed, one person used 1100g worsted weight yarn, another person used aprox. 900g of the same weight for a single bed blanket. Mine was a stashbuster, so I didn't take much note of the amount of yarn I used, I'm afraid. I hope this is a good guideline to start with! Hi there! I love this pattern, but I'm afraid i'm not clear on how to do this... I'm using several colors in the russian join method, so I don't have 'rows' per say of colors, just little splotches. this is coming out nicely. I'm confused about one thing though - I started and ended with 10 DC, then I worked 10 SC on top of that. (In my 'crochet language' I have a 'start row;, and then an 'opposite row') If you could just give me what to start the first four rows with, I'd really be appreciative. Thanks and God Bless - beautiful work I love this pattern! Thank you for posting a comment and I'm really looking forward to seeing your blanket - will pop over to your blog in a minute! You begin whatever way you like, starting with 10 DCs or SCs, it doesn't matter. But you only do ONE of these rows. After that, you do two of each row (in other words, the same row twice, one on top of the other). You start with a single row to give it a straight edge. when afghan is complete do you single crochet around the entire thing on outside edge to "close" it up?? or not?? Was looking for afghans to use up some of my stash for winter. Thank you so much this is so pretty. Found you on Ravelry. No worries - lovely to hear from you! You know, I'm just about to start another one of these because they make excellent bedspreads - I put the one in the picture on the guest bed, but it's been dragged around the house as the go-to blanket for naps/ sick days/covering up shabby sofa. So I need another for the bed :-) They're really warm and colourful and, yes, you're right, you can use up all kinds of everything as all the colours blend together when the blanket's done. And the best thing really is that you do it by touch, no need to look down, your fingers quickly feel the stitches - and off you fly! I just started this pattern about an hour ago, and I love it already. I am hoping it will help me use up my yarn stash (I have a 50 gallon tub full of yarn). If it works out right, my hubby won't be able to complain about my stash and I will have room to get more yarn! Thank you SO much for this great pattern! Your afghan is gorgeous, wish I could just take it and run, but will attempt to make my own. :-) Printing it out right now, will post pics on Ravelry and drop you a line when it's done. Cheers! I'm so excited to make this blanket! :D That is, after I finish up all of my last-minute Christmas present crochets, haha. Once I get around to it, I'm going to try creating it from side to side (instead of top to bottom) and see if I can tie the end threads from each color change into fringe instead of weaving them in! :) One question - you said that users cannot sell the pattern (of course), but are we allowed to sell blankets we make from the pattern? I look forward to hearing back from you, and please let me know if you have any questions. I hope you get this message - will contact you directly via your site as well. Please feel free to link to the pattern. Your site is lovely - I'm sure all your readers really appreciate your hard work! how fun! I have been looking for something special for a baby blanket...something little fingers and toes wont get caught in! thank you soo much for this pattern! Love this pattern. I have a lot of stash and will try this to make a baby blanket. This pattern looks very TV suitable. :-) Thanks for sharing. I found the link to your blog on FB/Ravelry. Love this pattern. It gives a neat "ripple" effect. Thanks for sharing your pattern this is my next project. Found your blog on Pinterest I will be following for now on !! Love love love this! I am almost finish with a baby afghan for my daughter's friend and have to do another so decided to use this pattern for a change. I just have not figured out what color combination to use yet since the girl does not know what she is having yet. Your pattern looks fast so I thought I might make one for girl and boy. Thank you for the inspiration! Tired of me yet?! LOL Just finished another afghan using your wonderful pattern. If you'd like to check it out, here is the URL: http://grammaritascrochetetc.blogspot.com/2013/05/blankets.html :) Thanks again for the great pattern! Just wanted to say that I simply adore this pattern & I made a blanket with it myself. I posted about it on my blog. (Of course with a link to your blog and pattern!) Hope you like it. Thanks for sharing this lovely pattern! 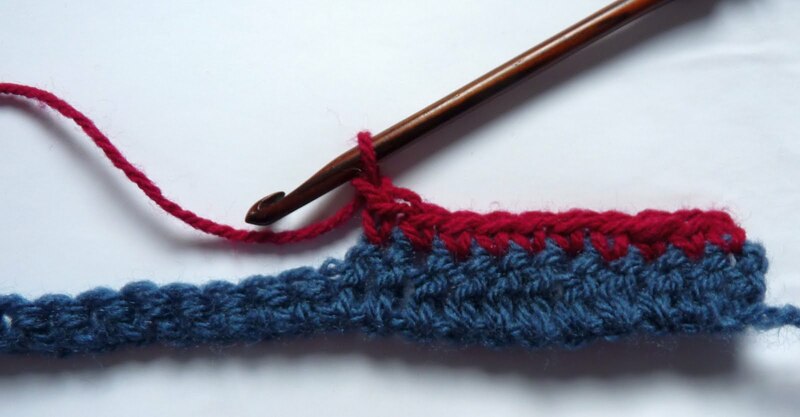 oh wow what a lovely pattern but may i say ... i would kill for a crochet hook like that its beautiful! They're beautiful hooks and really lovely to work with, hand-made, each one is an original. In any case, let me know how it goes! Where do I go on the "Media" website to print the PDF of the Ribbon Afghan? I do not want to subscribe to them just for a copy of the pattern. I very excited to begin my project and do not have a working printer and am trying to print it at a friend's however I'm not understanding where to go on the site to paste your link to get a copy? Can you please help!!! I don't know if it's just me...but this "Media" website to print the Ribbon Afghan doesn't work. I do not care to join their site just to get a free pattern. I love your pattern and am so ready to get started but the site referred doesn't give instructions on how or where to get the pattern. Can you help please!!! This website was originally free access, with no registration :-( I definitely don't want you to have to sign up with them to get a PDF version of this pattern, so I've published it using Dropbox, which means that if you click on the link above, it should take you to the pattern straightaway! Your wonderful pattern was just suggested on a FB blog! What a great yarn buster. I'm a little confused as to starting chains on each row. I see that you do a 2 chain to begin a sc row, what do you suggest for a starting row of dc? Do I start right in into the first stitch of 10 no matter the chain still added at beginning? Does this make sense? Thank you in advance! You start a row that begins with SC by doing 2 chain and then 1 SC in the next NINE stitches. The 2 ch counts as the first SC. 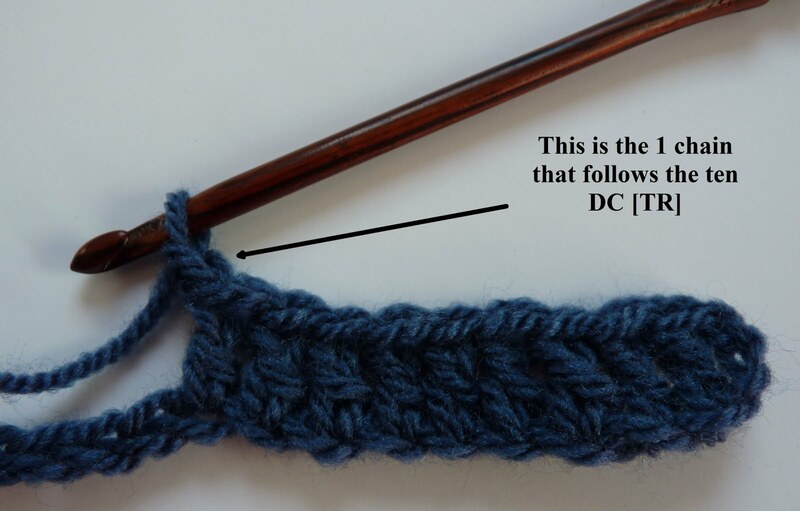 Similarly, start a row that begins with DC with 3 chain (or 4, if you crochet tightly - there's a bit of leeway here, but I prefer to do 2 for SC and 3 for DC) and then 1 DC in the next NINE stitches. These chains always count as the first stitch, SC or DC! thanks so much for sharing this pattern!!! I just found your pattern and want to thank you for publishing it! I have been looking for a pattern to use up my left over yarn, create something useful and clean up! I am wondering if it matters what weight of yarn is used. I have mostly worsted weight left over from other projects but also have polyester/acrylic in my stash. I'm assuming since there is a gauge to the pattern that the same weight is preferable. I know there are other crocheters out there that have a variety of leftover yarn & wondered if they used them in your pattern. What would you recommend? hello! I, also, think this afghan is beautiful! I am fairly new to crocheting; could you advise approximately how many yards i should expect to need for a full length blanket? any help on this would be appreciated! thank you! I'm afraid I can't give you the kind of answer you'd like - I'm in Europe, so we calculate yarn in terms of grams and metres! In addition, I think how much you will ultimately need will depend on the size of your hook, the thickness of your yarn, your gauge - and the size you plan to make your afghan. Are you dyeing to know ....? The Versatile Blogger - that's me!